A spectacular anthology of all-new material crafted by a stellar cast of award-winning cartoonists, including Graham Annable, Gabrielle Bell, Scott Campbell, Brandon Graham, Dean Haspiel and Harvey Pekar, Sam Henderson, James Kochalka, David Lasky, Josh Neufeld, Joel Orff, Robert Ullman, and Sara Varon. 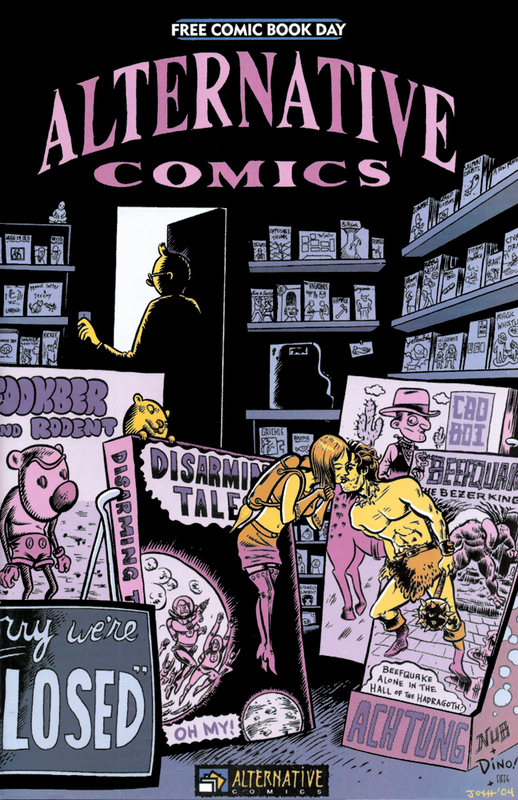 Alternative Comics #2 features an 8-page full-color preview of Nick Bertozzi’s graphic novel The Salon. Cover by Nick Bertozzi & Dean Haspiel, with color by Josh Neufeld. Originally released for Free Comic Book Day 2004, this anthology was the focus of an obscenity case brought against the owner of a Legends shop in Rome, Georgia. Involving two felonies and five misdemeanors, it took more than 3 years for the case to finally be put to rest. The owner agreed to write a note of apology in return for having the $100,000 case dropped. Read more about it here.